President meeting with Caribbean leaders at Mar-a-Lago. 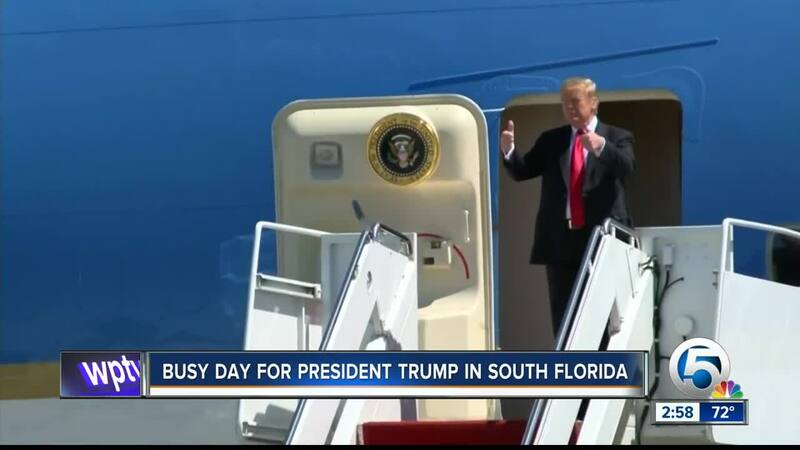 PALM BEACH, Fla. — President Trump arrived in Air Force One at Palm Beach International Airport just after noon on Friday for a busy weekend in South Florida. The White House says the President will meet with leaders of five Caribbean nations at Mar-a-Lago, his Palm Beach resort, in an effort to strengthen cooperation on security and trade issues. The meeting will feature leaders from the Bahamas, Dominican Republic, Haiti, Jamaica, and Saint Lucia. He'll also take part in the Palm Beach County Republican Party Lincoln Day Dinner on Friday night at Mar-a-Lago. Because of the President's visit, the FAA issued a flight advisory for 'VIP Movement' from Friday, March 22 to Sunday, March 24. Road closures are now in effect in and around Mar-a-Lago, and will go through Sunday, March 24. At this time, all forms of travel, including pedestrian travel, are banned on S. Ocean Blvd. from S. County Rd. to Southern Blvd. The travel restrictions also extend eastward to the ocean. Sanders says Trump will discuss potential opportunities for energy investment with those Caribbean leaders. According to Sanders, the United States remains "a good friend to the Caribbean and seeks to build on a proud legacy as the region's partner of choice." President Trump most recently visited South Florida on Friday, March 8. He held a fundraising roundtable at Mar-a-Lago after meeting with victims of a deadly tornado in Alabama earlier in the day. WPTV and the Associated Press contributed to this report.